First of all, congratulation to all who were brave and persistent enough to keep the elimination diet, based on FoodPrint intolerance test (more accurately - IgG allergy test). Some of you experienced results almost immediately and it was easier to keep the diet if health improvements were clear. Many needed to combine it with other type of "diets", eliminating both food and non-food personal „kryptonites“. 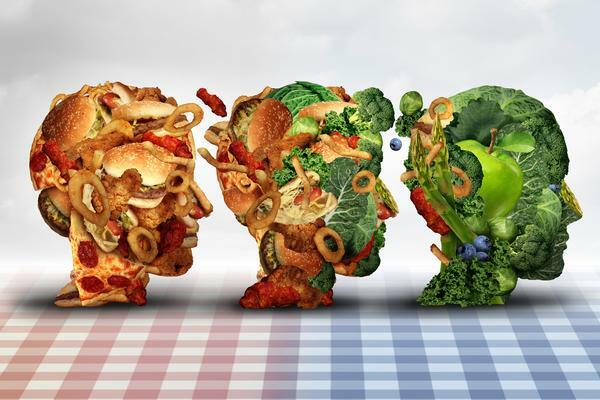 Maybe some had no visible improvement and as a consequence do not believe that food is connected to a health problem. If latter is the case, please remember that IgG allergy is only one piece of puzzle and one part of a complex, and highly individual, gut-healing Protocol 4R. In all cases, whether improvement has been noticed or not, keeping this test-based elimination diet have had a positive influence on health. Giving a long-needed break to overloaded immunity - by lowering overall inflammation mechanisms, it created more space for healing. 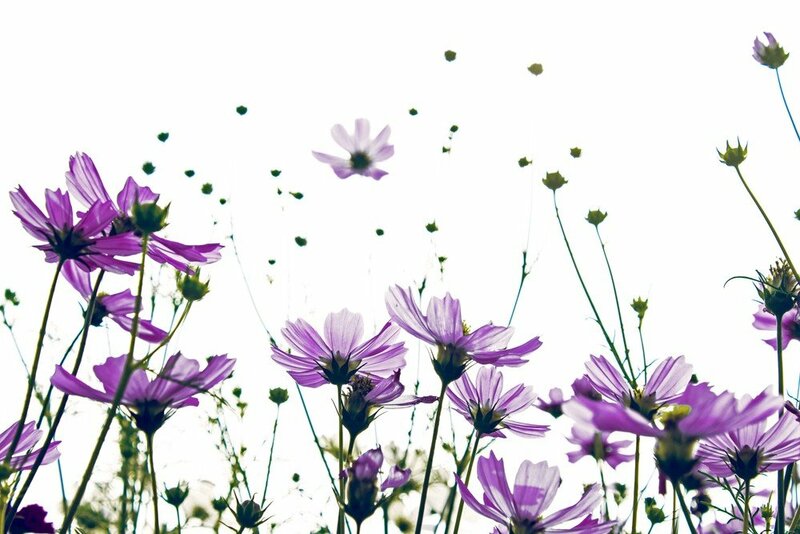 Rather than being occupied by daily fights with incoming allergens, immunity could use the spare energy for regeneration and repair. For many people, this could mean lowering general pain and discomfort. The recommended time for elimination diet is 3-4 months but what’s going to happen next - coming off the diet - is no less important. Many make a crucial mistake of jumping off the diet suddenly and „treating“ themselves to a good portion of „forbidden“ food. Be it a whole slice of (wheat) bread, cake or a pot of ice cream. If this is how you ended the diet, unfortunately it is possible, it was a waste of time. By sudden introduction of your „kryptonite“ food, before making sure the gut is healed and sealed, you’re risking not only a bad reaction to given food but also continuing inflammation and leaky gut syndrome. Please do not waste your time and £££ testing for IgG allergy, if you’re not going to do it right or do not yet understand the reasons why it‘s done. Bad rep to these diets and lab tests come often from people, who see and treat this diet as a simple black&white list. Always try to find practitioners who can take you through the full and complex functional medicine „Protocol 4R“. This protocol may take several months or even years, depending on your situation and the level of ill health. Be patient. Quick fixes by straightforward elimination diet may work fine for those reasonably healthy, but symptoms may creep back slowly. 1. Do not stop the diet abruptly. Do not eat a whole portion of previously eliminated food. Avoid stocking up on any foods you were avoiding for a period of time. Go slowly. 2. Make sure the gut is healed and sealed and ready to take on the previously allergenic load. You can test this directly, by doing a special test for gut permeability, or indirectly - by repeating the FoodPrint (or other IgG test), to show the level of improvement. 3. Forget the first 3 foods on the list which scored the highest at least for another couple of months. For many people this is often very difficult as it involves wheat and/or gluten, soy, egg and dairy. Unfortunately 90% of the cheapest and most accessible foods contain one of these four ingredients. Watch out and read the labels. 4. Start with the least reactive foods on the list (orange colour and lowest in red) introducing them in small amounts, no more than 1-2x per week. Do it as if you were introducing new foods to a baby - no more than a small bite or one leveled teaspoon. 5. Rotate. Do not eat any of listed food (or ideally any same food) every day. For example if you had oats (porridge, oatcakes etc.) on Monday and Tuesday, avoid them for 3-4 days and have something else instead. If you had high reaction, make these avoidance mini-periods even longer. In my opinion, this is a principle of so-called varied diet. Varied diet does not mean eating 15-20 different ingredients each day every day. Eating simple meals, ideally up to 10 ingredients daily (read the labels!) and rotating them over time, is what varied diet should look like, taking into consideration our genetics. Our ancestors did not have a huge variety over a day or a week, but changed diets with seasons. The number of various ingredients in their meals was much lower. Possibly the only exception were days of feasts, several times per year, but not every week as we tend to practice today. When your health or symptoms improve enough, after a year or even two, you may wish to re-introduce the most common and strongest allergens: gluten, eggs, dairy, nuts and soy. Think about the reasons why this is? Why they are the worst offenders and if, in your case, it is worth to eat them at all? Double check the IgG test, coeliac panel Cyrex Array3 or true IgE allergy. You may be surprised what you find! Moreover, gluten is a thyrotoxin and tissue mimicker, causing problems even if none of these tests show any positives. Soy also interferes with thyroid function, it’s a well-known goitrogen, plus most of soy is GMO. This is another new and potentially dangerous type of concern for all of us, sick or healthy. Gluten and grains - make a home-made bone broth soup into which you add some grains in form of pasta. Do not eat pasta at first when having this soup. Miniature amounts of protein will be released into the liquid. Bone broth is helping to heal your intestinal lining at the same time, so the effect of re-introduced gluten is hopefully dampened down. Another way is to start buying porridge oats which are not gluten-free certified and as such are usually contaminated with few grains of wheat or barley. Choose organic if you can. Dairy – a good way to start is with butter (goat or cow) and fermented dairy products. Try organic milk home-made sour whey and quark (soft cheese) or a teaspoon of coconut-dairy culture mixed yogurt. 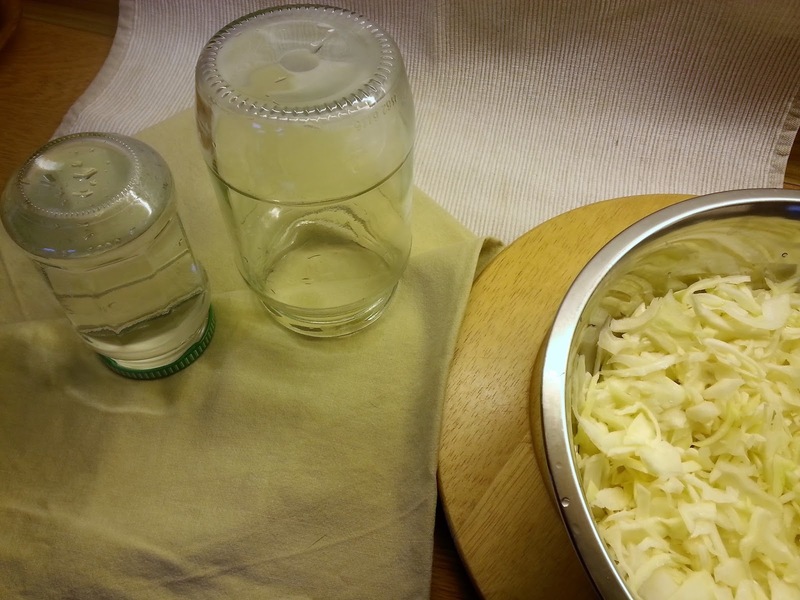 Hard cheeses only as few strands of grated cheese at first, no more! Probably the best way of introducing dairy protein back to your life is in form of colostrum supplement, which can seal your gut very quickly. It's the original function of colostrum to do just that in newborn! Egg – split the white and yolk, depending on your needs. If you tested for both, you can introduce both at the same time but in very small amounts. Start introducing egg which is not highly denatured (such as happens after baking). Try soft-boiled or scrambled egg made for another family member. Have only 1-2 teaspoons at first and only once per week. Eat varied diet (see above what I mean by it) by rotating all foods weekly or seasonally, specifically those previously tested positive. Do not eat same foods and food ingredients every day, all day. The biggest concern is presence of highly reactive and pro-inflammatory gluten, wheat & other grains, denatured powdered egg, dairy and soy. Most of these can be hidden elsewhere, including „health foods“. This includes vegan or vegetarian meat imitations, some made of pure gluten, some of pure soy, or Fusarium mold. Frightful! Cheap meat is also filled with wheat and soy flour, as well as ready-made meals, cakes, bars, non-dairy replacements and sauces. Another bad example is snacking on whole 100 or even 200g bag of nuts at once. Remember that your immune-based sensitivity to food (by forming an IgG antibodies), is only one type of body reaction to food. If you test IgG and correctly proceed through elimination diet and nothing improves, you have to dig deeper. There can be several other reasons, why symptoms related to food can persist. This is why we use Protocol 4R. True allergy to foods which shows as an increase of IgE (not IgG) antibodies. Environmental reactions. Both IgE and IgG type allergy can develop towards chemicals hidden in food, or every-day cosmetics, cleaning products or even to surrounding air and environmental dust (biotoxins - pollen, mites, molds and their mycotoxins – this is sometimes called the sick building syndrome). Enzymatic insufficiency based intolerance to foods (such as lactose or histamine). This deficit of enzymes can be natural, such as loosing tolerance to large amounts of milk sugar lactose in adulthood. It can also be caused by gut dysbiosis and inflammation of intestinal lining. In such cases the lining lost normal function and does not produce enough DAO enzyme to deal with all the histamine. Another example is dysbiosis-induced fructose malabsorption (or wider FODMAP malabsorption). Reactions to solanin, salicylates or other plant-protecting phytochemicals. Cross-reactions. Both IgE and IgG tested foods/items can have several other, cross-reacting pals. For example, if you don’t eat buckwheat but tested positive for all other grains, it is very likely you’re going to react to buckwheat too, even if test does not show it. Cross-reactions have to be taken more seriously when dealing with autoimmunity and this stricter version of elimination diet is called AIP = autoimmune protocol. The patient is basically told, it's his or her own fault and most likely a consequence of hectic stressful life and/or internal emotional problems. When he or she changes her life outlook, thinking, job, beliefs, or even house and partner, everything should get better. Yes? Medical dictionary meaning of this word is slightly more complicated and we learn, that even asthma, migraine, and peptic ulcer is "psychosomatic"! Therefore more or less related to our emotions and stress, as are most chronic illnesses... Shouldn't we all be sent to a psychotherapist for a correct diagnosis?! After a long and somehow uneasy decade of self-managing this condition, I have looked at the NHS website with a hope, that there would be something new on offer in terms of testing, treatment, guidance or a specific support. I haven't found anything new, but their website pointed to ME Association with the article I copy below in full. Among the top plasma biomarkers differentiating ME/CFS patients from controls were decreased levels of betaine, complex lipids (lysophosphatidylcholine [LPC], phosphatidylcholine [PC]) and sphingomyelin (SM), and increased levels of triglycerides (TG), α-N-phenylacetyl-glutamine, ε-caprolactam and urobilin (Table S2). Set enrichment analysis of the results of logistic regression models revealed that ME/CFS subjects had reduced levels of PCs and dysregulation of the choline-carnitine pathway (Table 2). I do hope that the mystery of CFS is on a good way to be resolved by mainstream medical science. In the meantime, functional medicine and nutrition has a lot to offer to support overall health if you want to be pro-active and not just wait for "magical pill". 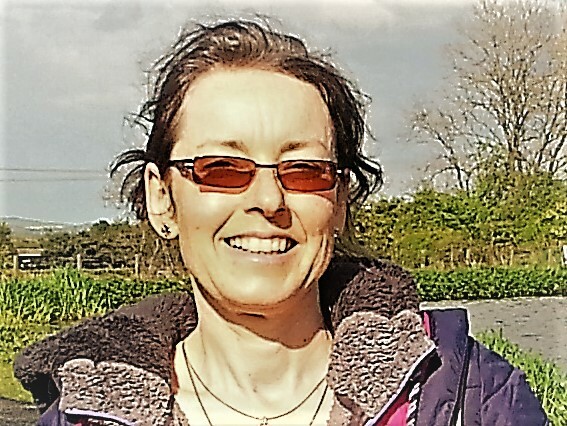 Check out my system of coaching here or, if you're already able to walk for at least an hour and wish to get outdoors, send me an email to book a Walk&Talk experience. W. Ian Lipkin, Director of the Center for Infection and Immunity and the Center for Solutions for ME/CFS at Columbia University, has written the following letter several days before the Fourth Annual Conference on Psychosomatics at Columbia University this weekend. The original letter can be found at this link. The Center for Infection and Immunity (CII) has been committed to ME/CFS research since 2010. We began this research with generous support from the Chronic Fatigue Initiative of the Hutchins Family Foundation, the National Institutes of Health, and the Microbe Discovery Project. In 2017, the CII was selected to host one of three NIH centers funded for collaborative research into the biology of this disease. The Center for Solutions for ME/CFS (CfS for ME/CFS) includes representatives from #MEAction and Solve ME/CFS as well as clinical and basic scientists drawn from leading academic institutions and clinical sites across the United States. Committees convened by the National Academies of Sciences, the National Institutes of Health, and the Centers for Disease Control and Prevention have also concluded that ME/CFS is not a psychosomatic disorder. We are committed to actively investigating the causes of immunological and metabolic abnormalities in ME/CFS. Our hope is that this work will enable insights that lead to treatments. 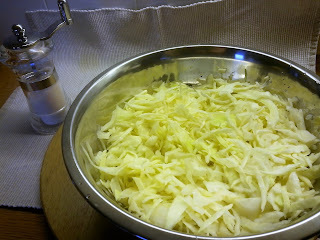 Kraut, or cabbage, is a traditional food in many parts of the world. Sauerkraut is raw, finely sliced or shredded white or red cabbage, which is then lacto-fermented in salty brine, by wild bacteria and yeasts, naturally present on the cabbage leaves. It is therefore ideal to use organic or home-grown cabbage. 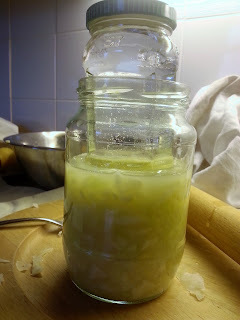 The final product is full of good bacteria (probiotics), full of fibre (prebiotics), and a good source of vitamins such as C, B and K. Cabbage is also a good source of glutamine, an amino acid which helps to heal and seal the gut lining. Good amount of sulphur compounds support healthy liver detoxification. 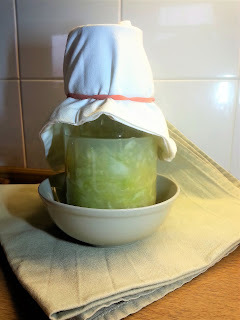 The only people, not to be advised to eat too much of aged and fermented foods such as this cabbage, are those with severe histamine intolerance. For the rest of us it is a quick, tried and well-tested way how to re-establish and re-balance our gut microbiom. 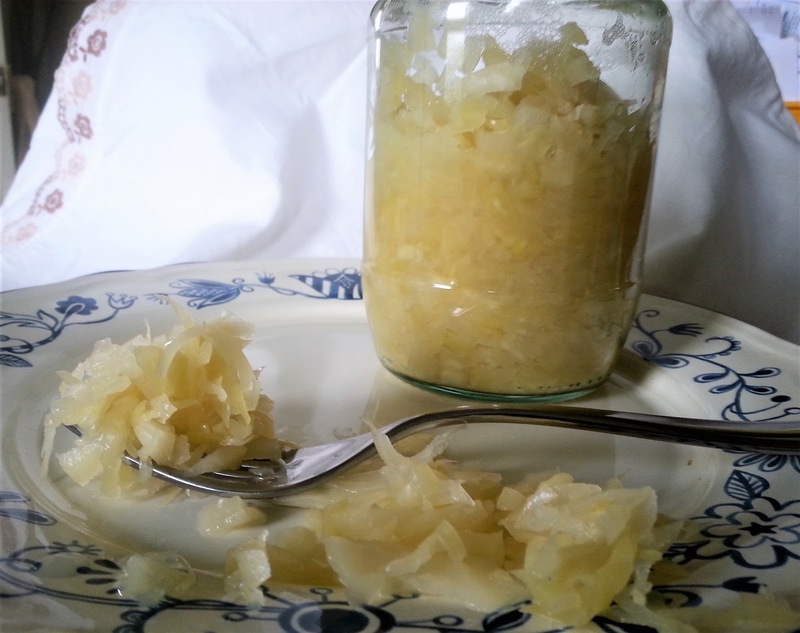 If you've never had any, starting to eat sauerkraut after longer period of time, or have digestive issues, do start very very slowly. Literally few shreds or a teaspoon of juice are enough per day for the first week. · Remove several outer leaves and the core. · Slice very thinly using knife, mandolin or shredder. 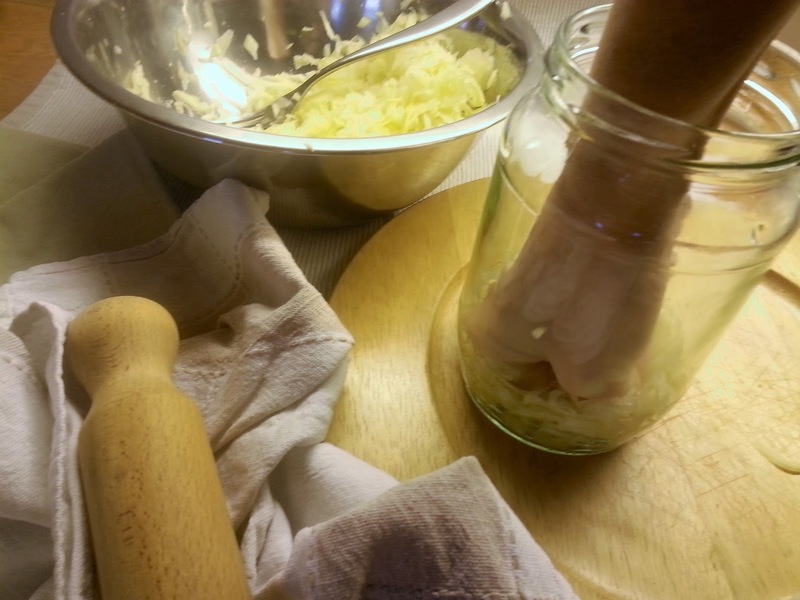 · Place the first layer (2-3 handfuls) into the bowl, salt the top generously. · Repeat until all the cabbage is used. · Cover with clean napkin and leave to stand for about 30 minutes. 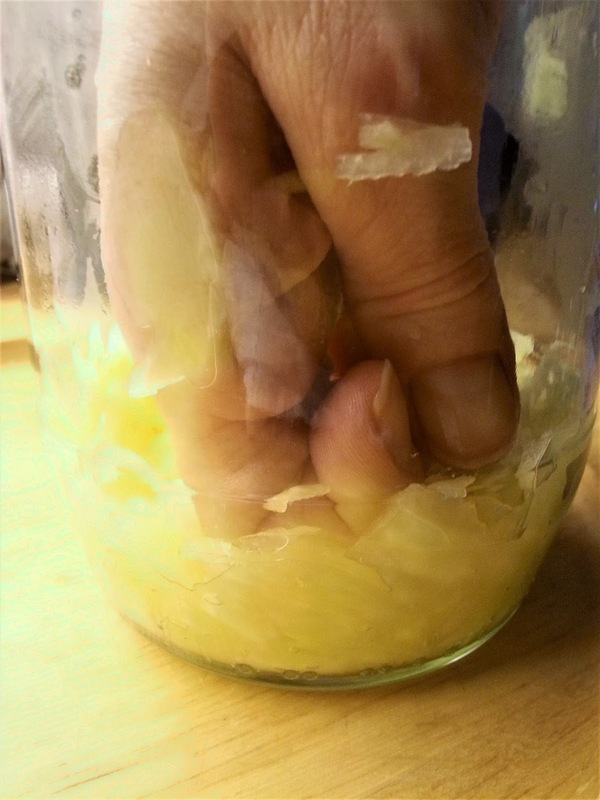 · Mix everything and keep pressing with your fists to release the juices. · Fill the larger jar, keep pressing the cabbage well, do not leave any air pockets! 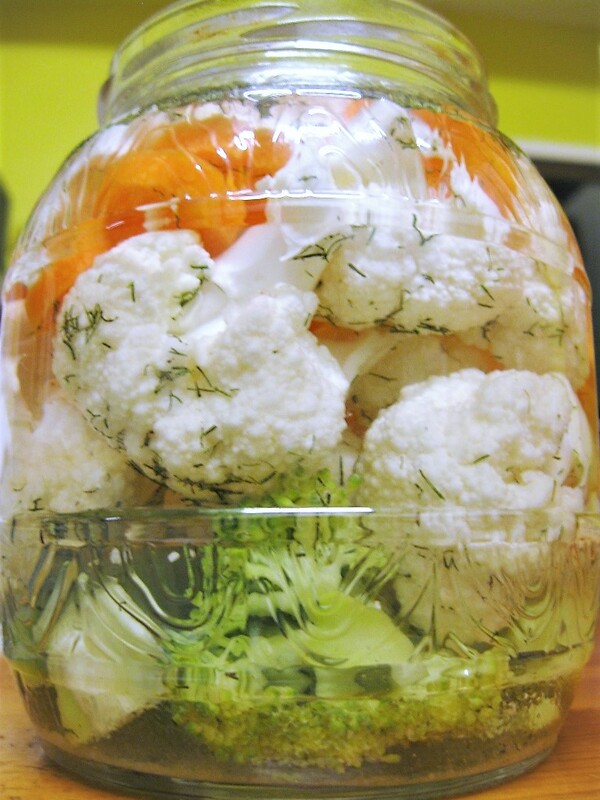 · Fill the smaller jar with water and push inside, cover with clean cloth or plastic. · Leave to stand in cooler, dark place. Not too cold! About 16C, bottom kitchen cabinet if your house is not overheated. · Check every odd day to make sure all the cabbage is well-covered with brine. · Ready to eat from day 5 but ideally after 3 weeks, as you will get different strains of bacteria. · After 3 weeks keep in the fridge. Feel free to experiment with other veggies! How to read your genetic test? 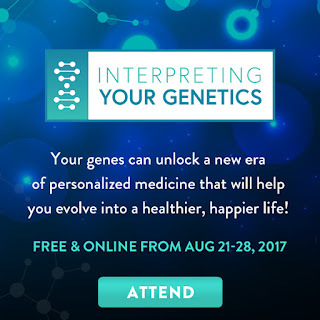 The Interpreting Your Genetics Summit will help you translate your health data to better understand your predisposition for diseases and how to minimize manifestation, expose genetic health traits your children are likely to inherit, determine whether your medications and supplements are right for you, potentially unlock previously unsolved health challenges and more! 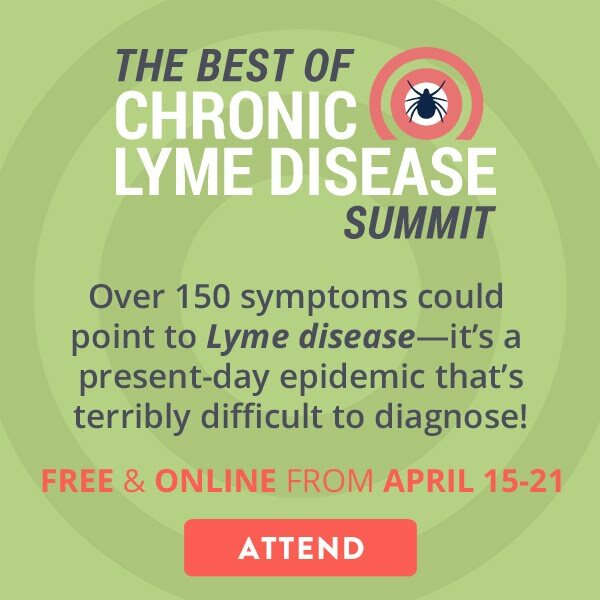 All reasons not to miss The Interpreting Your Genetics Summit, online and free from August 21-28, 2017! Please also bear in mind, the genes are only responsible for tiny part of your health and it is up to the environment they exist in, to either express or silence them. You can get a hint in this video with Bruce Lipton or if available here. This is not just about food. We have to make tens or hundreds tiny choices daily and only some of them directly relate to our food. Yet in larger context, the food is the driving force behind the way we live. What do we listen to when asking internal questions? Is it our logic or knowledge (our mind)? Is it our heart or our emotion (ego? ), craving? Is it our experience? Traditions? Or we call our friend? Do we ask questions at all? Or do we just run an automatic pre-recorded “tape” of our life? My clients are clever and intelligent people and already understand what good food means today. After 3 months of coaching they have even better understanding and motivation. Do they always choose good food? No. Do I always choose to eat well? No. Sometimes it’s a choice between ‘eating bad’ or ‘not eating’. The ‘not eating’ part is becoming popular through movement of Paleo and intermittent fasting. The ‘not eating’ part has always been embedded in our culture and is practised to some extent in nations who take fasting periods of year seriously. It takes time to re-learn this ‘not eating’ part… or should I say 'un-learn' the way we eat today? There are several stages to grow through, before fasting becomes easy, natural and won’t cause more harm than good. Please always seek advice from sources you trust. What makes us to choose wrong food is not completely up to us. Many times we just don’t know what’s inside that meal. If the packaging says "healthy", "natural" or "good for you" it means absolutely nothing! If it has NO packaging, there is a better chance this food is fine. Much like some houses – they have attractive front cover, layer of new paint, or solid entrance gate, but rooms can be uninviting, cold and full of toxic air and mould. Much too often we end up hungry in places or situations we have no choice. We cannot always carry a suitcase of food with us. Do not stress if there is no choice. Frustration can weaken digestion and make it all even worse. Look at the situation as an experiment, if you are really hungry and have no allergies, try again your old fast food. Observe your reactions and feelings of well-being days after. Do you feel slightly unwell, crampy, forgetful or irritated...? It might be a good sign your body is clean enough to sense what's bad for it! Next time, be better prepared, seek different solutions. If we do have various choices (as we mostly do), it should be a huge celebration and reason for happiness and feelings of resource abundance. By the way - did you know that feelings of 'resource abundance' is one of the mechanisms to increase gut serotonin, hence the gut motility to prevent constipation? Embrace the situation when the choice is wide and do the best you can. Why choose food wrapped up in plastic if we can have it without? 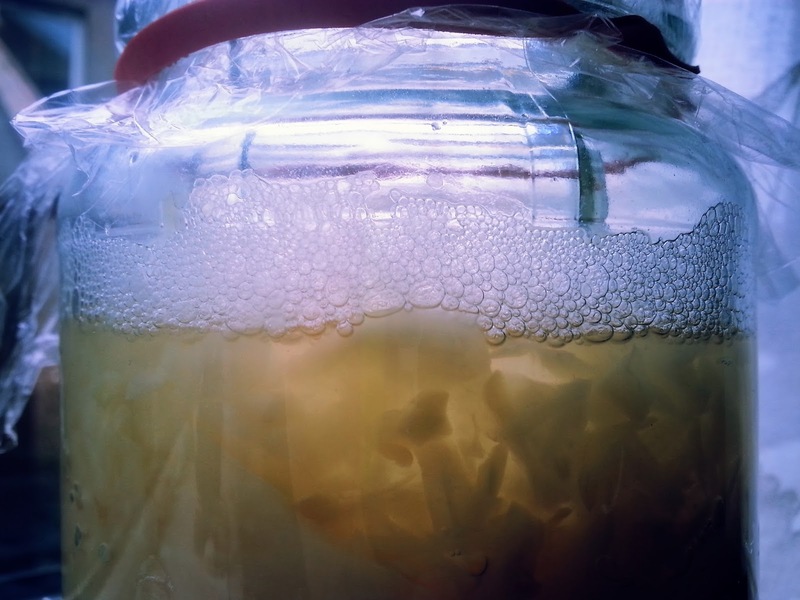 Less waste, less estrogenic plasticisers, less wrong kind of bacteria. Why choose drinks in plastic PET bottle if we can filter tap water and add lemon, put it into glass or steel bottle, or even drink directly from the spring. Why choose boxes of industrially made flavoured snacks, if the aisles (or markets) are full of fresh vegetables, fruit, whole nuts, some of it organic and some even local and seasonal. Why to spray our home with toxic “air fresheners” and our bodies with toxic perfumes if we can open window or use few drops of pure essential oils diluted in suitable base, for whatever use we need. Celebrate your freedom of choice, and uniqueness of your ideal diet and lifestyle. We all have slightly different needs and we should be proud and free to ask for it. If the people around do not understand yet, we have an opportunity (and calling) to become creative and have our small mission in this world. We can show others a different way of life, be an example, or try to explain, if they care... Or we can learn to ignore the situation or even leave such place if it becomes too detrimental and people are just not ready. This may be very hard decision at first but the good side of any crisis is that it can bring us to those who vibrate on similar frequency. Such move can change our life and make us happier and healthier. Nutriwellness is dedicated to educating about the power of food and nutrients in achieving better health. My name is Katarina Tothova and my own struggles lead me to immerse in study of naturopathic medicine and nutrition. Now I would like to assist others in finding and using many natural and science-based choices available for our health and wellbeing. PayPal payment option. Please let me know if donating. THANK YOU!